RUBI was created in 1951 with the invention by the Boada brothers of a tile cutter for mosaic tiles. This new tool, christened with the name of Rubi, served as a stepping stone for developing a strong company that supplies professional tools for cutting and laying tiles, now a global company with a presence in over 100 countries and an extensive network of branch and participated companies worldwide and has always been a brand specialized in quality products and services for cutting, placement and maintenance of ceramix & porcelain tiles. The Rubi range contunies to evolving according to changes in materials and their applications, offers construction professionals a range of specialized and technically advanced products that includes tools and machines needed for a good placement with perfect finishes. 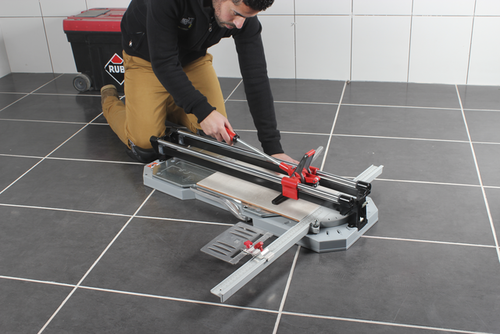 A Rubi tile cutter is an essiential item for any professional tiler, a Rubi cutter is able to cut accurtaly and quickly almost any ceramic tile or porcelain tile, Rubi tools have long been praised for thier ease of use and realiability. Known for thier vast range of manual tile cutters, including some iconic models stocked by Target Tiles such as the TX Range & Pocket 50 manual cutter. All other models from rubi such as Rubi TS, Rubi TF, Rubi TR and RubiTP cutters are all avaliable for order.